that picture makes me happy. congrats man! I'm just happy to see your mustache is coming back! Nice! Well done sir...such an awesome fish. Nice and good job here you done. Saw the title and I've been beaming ever since. :) Congrats! My forearm was sore too after I fought one of those big bastards. Nice fish man. @john montana - it makes me happy as well. It took one carp to understand your draw to fishing for them. @jergens - i hate to report to you...that pre mustache was shaven off. It will be back, I just don't know when. @LAR - thanks for that extremely helpful information. Sanders - why thank you sir. @Tampa - thank you as well. @e.m.b. - who doesn't love sugar lips? @alec - cheers to you sir. when do you start up in Craig? May 30th! Hope to see you around! Nice. 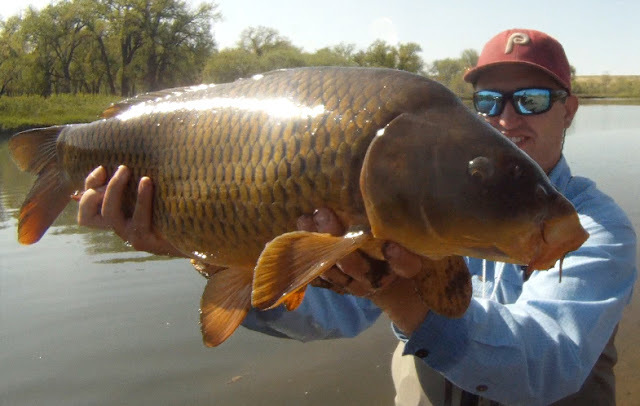 I hope to do catch a carp on the fly this year.